Check it out – my secret pal ROCKS!!!! 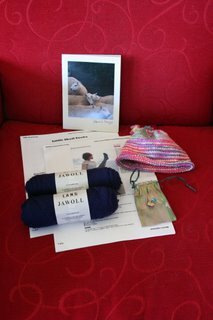 Do you see that adorable newborn cap??? And superwash sock yarn! Score! She also sent a really cute little stitch holder shaped like a piece of cherry pie, some sock patterns, a cute sheep card and some chocolate. What? You don’t see the chocolate in the picture??? Oh… need I remind you that I’m pregnant??? Thank you so much, secret pal!!!!!!!!!!!!!!!!!!! 1.) A baby cardigan from Debbie Bliss’ Baby Knits Book using Lion Brand Cotton-Ease. I hate the buttons. I can’t decide if I’m willing to take them off and put new ones on. 2.) 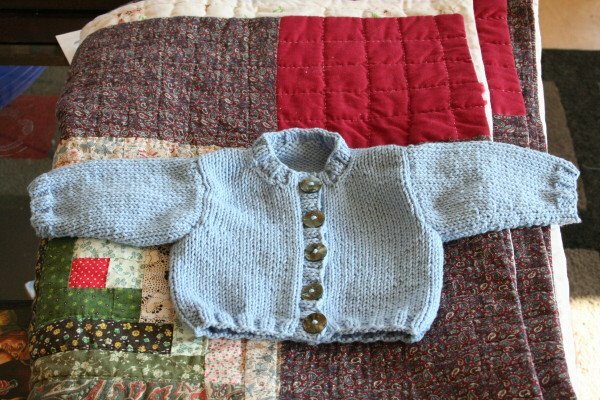 A cardigan from Debbie Bliss’ Special Knits book using Debbie Bliss wool/cotton from my stash. 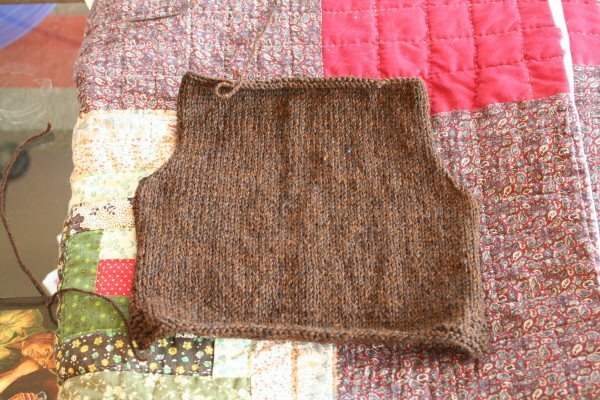 The sweater needs buttons but is otherwise completed. I loved this pattern. I think I’ll make more. The gauge is perfect for Knit Picks Shine Sport. I don’t really care for this yarn but it’s been sitting in my stash for 2 years. What else could I do with 3 balls of it? I still have some left over so I might try to squeeze a pair of booties out of it. 3.) 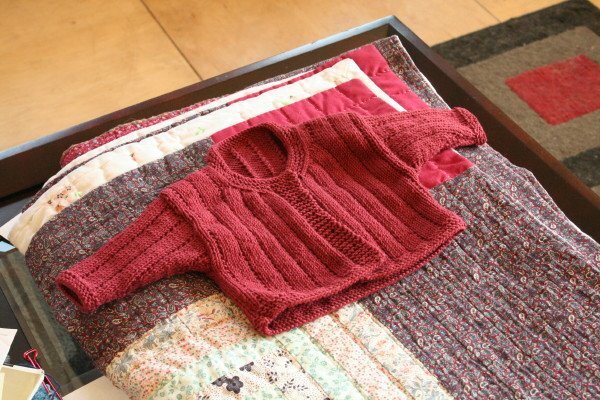 A baby raglan sweater from Debbie Bliss’ Baby Knits Book in Lion Brand Cotton-Ease. I was going through LOTS of Cotton-Ease last week. I’m almost out. I might check out eBay to see if I can find more. 4.) 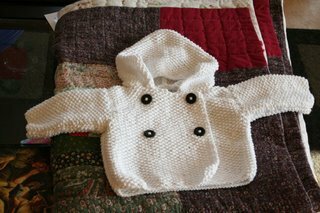 My current baby project is a hooded kaftan from Debbie Bliss’ Special Knits book. It has embroidery on it but I think I’ll skip it because I don’t think it would look so good with this yarn. The yarn is Plymouth Encore DK in a brown heather. I have 6 balls of this and have not been able to find a use for it. I think I’ll try to get some baby sweaters out of it since it is machine washable/dryable. Look at all that lovely knitting for your new baby! 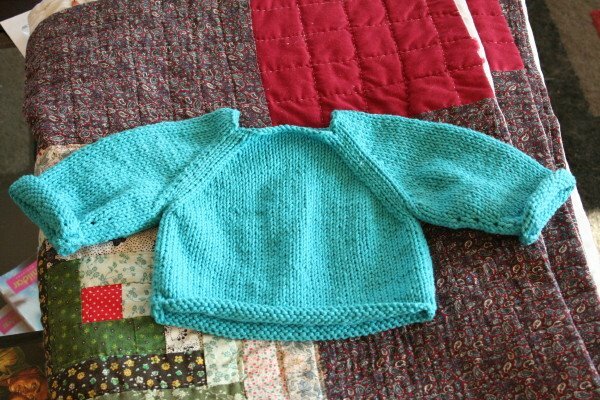 Love the seed stitch hoodie! Glad you liked the package! I’m putting together another one for you and was wondering if you’d rather have a couple more smaller packages, or if I should put the rest into 1 larger package to be sent towards the end? All of your projects are adorable, but my fave has to be the hoodie.